The generous bequest of Dr. Dorothea E. Wyatt has made the Wyatt Exploration Program possible. A stalwart supporter of her university and her discip line, Dr. Wyatt made this extraordinary gift to further develop and improve the program in history here at UM-Flint. A graduate of Stanford University, Dr. Wyatt as one of the original sixteen faculty members of the Flint College of the University of Michigan when it was founded in 1956. 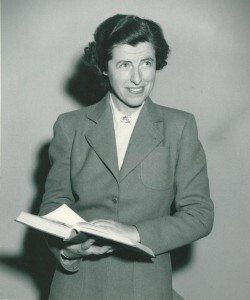 She was the first chair of the Department of History and she served as the University’s Counselor to Women, the Secretary to the Governing Faculty, and on countless university, college, and departmental committees throughout her career. 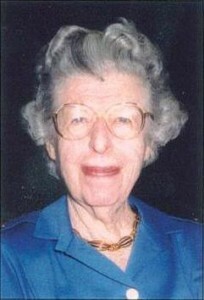 An adored teacher, Dr. Wyatt specialized in American cultural and women’s history. She was an unflagging advocate for the humanities and women’s issues. In 1989, UM-Flint recognized her dedication to the university and these issues by creating an award in her name for faculty and staff members who work to better the status of women on campus. IN 1974, Dr. David M. French spoke of Dr. Wyatt’s uniquely personal contribution to the university, writing, “Her greatness of spirit, her generosity, her sincere interest in students young and old… and the uninhibited way she has always shared her joy in learning and scholarship with those around her have run like a golden thread through the eighteen years since the Flint college was founded.” As a scholar, Dr. Wyatt is primarily known for her biography of Julia S. Tutwiler (1841-1916), an early advocate for women’s rights and educational reform in Alabama. What has brought us together as students and faculty in our University of Michigan- Flint College has been an abiding faith in education. We have all been seekers after knowledge: of ourselves, of the world around us, and of the ideas and ideals that have stirred and enriched mankind… For the true object of a college education is not to learn all that one will ever want to know but to acquire the ideas, habits, and methods needed in the continuous process of educating oneself during the years to come. The Department of History as the University of Michigan-Flint is proud to be the heir of that spirit and philosophy. We believe that the Wyatt Exploration Program and other opportunities provided by Dr. Wyatt’s generosity will be a fitting testament to the life of this fine teacher, scholar, and advocate. If you are interested in helping the History department to continue to offer the quality education that Dr. Wyatt believed in please consider donating. Click here to donate.